What about those today who live and die without ever hearing the Gospel? Are they destined to Hell? I believe this is what Billy Graham had in mind in May of 1997 when he made a very controversial statement during an interview of him that was being conducted by Robert Schuller.1 He said that he believed that God is "calling people out of the world for His name" — including the Muslim world, the Buddhist world, the Christian world and the non-believing world. He added, "They may not even know the name of Jesus, but they know in their hearts that they need something that they don't have, and they turn to the only light they have, and I think that they are saved, and that they're going to be with us in Heaven." Schuller responded by asking, "What I hear you saying is that it is possible for Jesus Christ to come into human hearts and soul and life, even if they've been born in darkness and have never had exposure to the Bible. Is that a correct interpretation of what you're saying?" Graham's reply was, "Yes, it is...I've met people in various parts of the world in tribal situations, that they have never seen a Bible or heard about a Bible, and never heard of Jesus, but they've believed in their hearts that there was a God, and they've tried to live a life that was quite apart from the surrounding community in which they lived." Some might respond by saying, "If those who live and die without ever hearing of Jesus might still be saved by their faith in God, whereas those who hear the Gospel and reject it will be lost, then perhaps we should stop proclaiming the Gospel!" In Part 6 of this series answering the question, "Are there many roads to God? ", we'll address the conundrum of the Cultural Christian. 2) See, for example, Billy Graham's article, "Why do Christians believe Jesus is the only way of salvation?". See also "The Only Way?" 3) Graham's consistency in clearly preaching that Jesus is the only way to Heaven is clearly demonstrated in a video clip that can be found on YouTube. The clip, which runs 7 minutes, shows excerpts from 7 sermons delivered between 1957 and the present in which he affirms over and over again that Jesus is the only way to God. 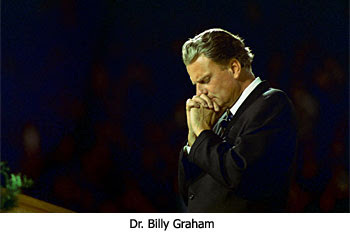 As of March 5, 2010, the video was mislabeled, "Billy Graham denies Jesus..." It should be labeled, "Billy Graham affirms Jesus as the only way to God." How do I say this? I guess I just come out and say it. While these blog posts are great, the fact is they are redundant articles straight out of the Lamplighter Magazine - which I've already read and is easily available at the Lamb & Lion website. Frankly, I'm really uninterested (and to be honest - quited bored) in this blog right now because of that fact. Sorry but I have to call it like I see it. Not everyone gets the Lamplighter or are as well read as you are, Billy. What kind of articles are you looking for here? Jesus is the only way to God and that is a fact! I have been verbally brutalised (written)by those who seem incapable of understanding the lengths to which The Lord has gone for making Salvation uncomplicated, childlike, even ‘easy’ to be born again. These are harsh in cold judgments of those that do not fit their superior ideal of what constitutes a genuine Christian. Only those with a perfect understanding of the Word, while dotting the ‘i’ and crossing the ‘t’, have their personal approval to be classed as ‘genuine’. From lofty superiority they callously deride and condemn the imperfect, struggling soul as having a ‘false conversion’. “Believe” in The Lord Jesus Christ to save from sin is impossible to them, they lack the confidence in the power of Christ to seek out and to save the lost. To give The Lord no credit for seeing the intent of the heart while they glower critically at the outward appearing; these need to add a plus, a work, a certain approved behaviour before they will acknowledge the reality of a saved soul. I agree with what Dr. Reagan has said in this article and acknowledge these certain souls will not have the rewards at the Bema seat they may have otherwise had; yet they are saved from hell fire through Christ’s Blood that cleanses even from the sin of ignorance. For that, these criticisers will one day learn to be grateful. Contrary to how it may sound, I'm not trying to be critical and I APPRECIATE TREMENDOUSLY that you GENEROUSLY and IMPRESSIVELY asked for my input after my comment that wasn't flattering. Bascially up to this point it seemed that none of the content in this blog was just copy and paste content from either the magazine or articles from the magazine or articles found elsewhere on the Lamb & Lion site. That made it fresh and interesting and new (to me at least). I still love this site and will visit it everyday, several times a day! It's your blog and I'm just a visitor who couldn't do what you do half as well so take my commment for what it's worth (maybe not much). Anyway, thanks for listening and MAY GOD BLESS YOU FOR ALL YOU DO!!!!!! hey billy, while i understand where you`re coming from, i accessed this blog at least a year and a half before i got lamplighter. i`m sure there are hundreds,maybe thousands who read the posts but dont get lamplighter. b.t.w even tho i read the articles in the magazine, i still like the discussions on the article, and nathan, i dont know about billy but i`m still waiting on the luke 21 study. cmon lets get er done:) also, i`d like to see the polls again. Someone on here put me onto 'Lamplighter', it is very good when I get the time to read it, and my eyes let me. Usually the blog is all I can manage to get the fellowship I need. I do so agree with Billy about the work done by Dr.Reagan and Nathan. Thank you both, and your bloggers so much. Your comment "even tho i read the articles in the magazine, i still like the discussions on the articles" was a good one. While I still would prefer "fresh" material here I guess it does give an opportunity for us to chime in on the subject/s. I wasn't happy with how my analysis of Luke 21 turned out when I presented it to a classroom of 80+ year olds, so I've shelved it to rework it more later. You guys are so knowledgeable about Bible prophecy I have to keep my game up. I will post more articles based on the polls, Hartdawg. They're pretty time intensive, but fun (6 jokingly picked Soylent Green - haha). Fear not, our next series goes chapter by chapter through Revelation. It's a compilation of 6 people's efforts. Dawg, now, stop drooling! i`m looking forward to the one on revelation. i been looking at every commentary and concordance i can get my hands on regarding the 24 elders. more on that one later. i`ll just say they are DEFINATELY the church. Nope! Let's be fair. I've always heard it's 12 from the OT, and 12 from the NT. 12 is the number of government [as I recall]. God will pick 12 OT saints that best represented His government to the OT world, and 12 NT saints [not just all 12 Apostles] who, thru-out the whole Church age, that best represented His government. "These 15 Commaaa, oops! [crash] 10! 10! These 10 Commandments..."
10! 10 is the number that represents the Law! To clarify a little more, the 12 OT elders will become the top rulers of their tribe; 1 from each of the 12 tribes of Israel. And I can only assume that God will make a comparable balance with the Gentile Church age/world; 12 'nations' or 'ethnic' groupings...? "...crowns are promised to the church..."
Agreed, but you seem to intimate some exclusivity of rewards to the NT saints only, that I am not yet seeing. We know that the NT reveals a lot of things that were not clear, or hidden in the OT, but I am not aware of anything that excludes God from giving similar or equivalent 'rewards' to OT saints. From where do you draw your 'exclusive' conclusion that OT saints cannot receive 'crowns'? Revelation 5:8 "And when he had taken the book, the four beasts and four and twenty elders fell down before the Lamb, having every one of them harps, and golden vials full of odors, which are the prayers of saints." Again, for instance, from where, the significance of, and on what basis do they get these items: harps and golden vials? "...and o.t saints are ressurrected AFTER the trib"
Agreed again, and to further clarify, I should have included; "...the 12 OT elders will be the top rulers of their tribes..." in the Millennial Kingdom. Also note that crowns are 'positional symbols' of rulership. However, in this vision of future events in Heaven, we are apparently dealing only with the 'spirits' of the 'elders', [and I would say here; the spirits of 12 NT saints with glorified bodies, and 12 OT saints without...] as, apart from the description of Jesus in Rev. 1:13-17, no 'bodies' are mentioned. Are you sure what we're seeing in Revelation 4 concerning the throneroom of God and the 24 elders is at the END of the Tribulation, DrNofog? Because, Revelation 5 is a continuation of the heavenly scene and the Worthy Lamb shows up to open the Seals that bring about the Tribulation judgments. a most excellent point nathan. by the way, i`m the anonymous writer. accidentally clicked the wrong option. 4 comes before 6. and nofog, crowns are awarded on that Day (2tim4:8)spirits dont wear crowns and o.t saints are not ressurrected til after thhe tribulation so they can only be the church. what i dont understand is why 24 and not 12? Nope, Nathan, that's not what I wuz sayin'. I wuz looking at 7:9-14 "...a great multitude, which no man could number... ...which came out of the great tribulation..." which seems to be a vision, or according to one commentary, a parenthetic view of the total end number even though Ch 7 is still about the middle of the Trib. Chapter & verse on where you found that, please. Ok, so what am I missing here? These are the spirits of the OT saints before they receive their resurrected bodies and they can WEAR white robes [6:11, 7:9] AND HOLD "palms in their hands" [7:9], BUT crowns would slip right thru the 'spiritual' bodies of the 12 OT elders and fall around their feet?!? Dude, this is the heavenly realm... This is akin to the story about the skeleton that walks into the bar and says "I'd like a beer please... ...and a mop! - Your rules don't apply here! "...why 24 and not 12?" -- I don't recall ever hearing any significance of '24' other than it's 2x12 or 3x8, which explains why some divide them into 12 & 12. 1)crowns are promised to the church (not isreal but maybe they do get crowns)2)they are priest and kings to God(rev5:9)i`ll concede that that is true of isreal 3)they will reign on the earth. that is promised to the church but i dont think thats so with isreal.4)the fact that they already have crowns indicates the judgement seat of christ had already taken place. since the judgement seat had already taken place it stands to reason they are in ressurrected bodies. does that make sense?